I know this is only a fairly distant shot of this castle, but the sheer beauty of the surroundings mean it duly earns it’s place on the web site. Canna is the Westernmost island in the small chain of The Small Isles in the Scottish Inner Hebrides off the West coast of Scotland. It is linked to a tiny island, off it’s South Eastern tip, by a tidal sand bank, called Sanday. The island is littered with the remains of iron-age forts, standing stones and small settlements. 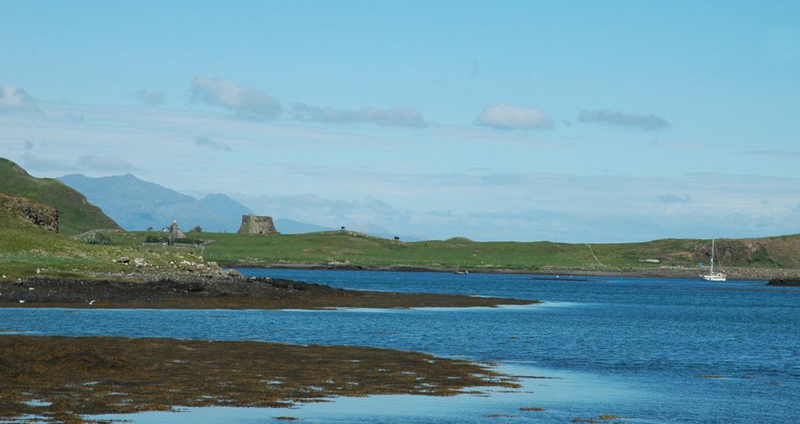 The castle lies at the Eastern end of Canna, on a stone stack that projects out into the sea. 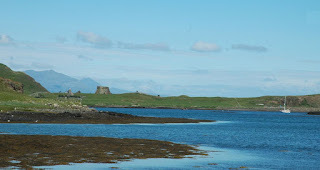 The photo shown here shows a view of the castle from Canna Harbour, peering past the headland that houses the modern ferry pier. All that remains, are the lower portions of a tower, built into the naturally occurring stone stack. Although records exist stating that this stone stack was used as a place of refuge between 1577 and 1595 no building was referred to. It is therefore thought that the ruins seen today, probably date from the late 1600’s. This was a small fortification rather than a larger traditional castle, built into the rocks of Coroghan Mor, has walls under a metre thick, and measures around 3 metres by 2 metres internally. Entrance to the tower is by a doorway set in the East wall at the end of a steep sloping footpath. It’s possible that there would have been other buildings on the summit of the stack, providing further accommodation and protection. The Isle of Canna web site. Situated just a few yards to the North of Catterlen Hall, the site of the original late 12th century hall can be still be seen in the field. All that remains now though, is a rectangular 30 by 20 metre grass covered platform with huge boulder foundations protruding through the turf. The platform survives to a height of around 1 metre above the surrounding field. The large hollow, shown above, possibly represents the remains of a cellar or basement. It is edged with stones half buried in the turf. The Pastscape website tells us that there are also faint traces of foundations of a South wing and cross hall in the field adjacent to the tower's platform, though at ground level it was impossible to see these earthwork remains. Alleged to have been built sometime around 1170, it was later replaced, in 1460, by the tower and hall to the South. Catterlen Hall, possible second tower! Peter F. Ryder suggests that the masonry remains, shown below, that lie to the East of Catterlen's hall and tower, could be the remains of a second tower. He suggests that Catterlen originally possessed two towers at the East and West end of a walled enclosure. There are, hidden within these walls, a vaulted basement with a blocked spiral stair case, lending some strength to his assertions. Above. The lower level of the alleged second tower. Above. Another view of the lower level of the alleged second tower. The photo shown above, shows the lower levels of a structure, possibly the second tower, with masonry very similar to that which the surviving tower is constructed of. Above. The remains of a small window in the lower levels of the wall. Peter Ryder thinks this may be the remains of a garderobe chute, and that its existence suggests that upper levels to this structure were originally in place, providing further strength to his ideas of a building here, if not a tower. Above. The gatehouse\bridge, showing the newer stone work. The gatehouse\bridge shown in the photo above, along with the returning wall to the left of the photo, are built of much newer material, dating to sometime in the 19th century. Above. Catterlen's surviving West tower. Above. Plan (from Peter F. Ryder) of the layout of Catterlen Hall, including the assumed second tower. 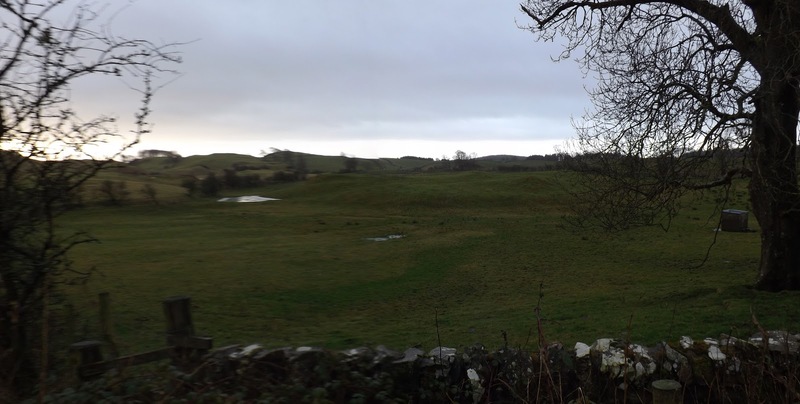 Peter Ryder suggests that the site layout at Catterlen Hall, would have reflected the quadrangular form of Greystoke nearby, but with no enclosure wall and\or gatehouse surviving, it's almost impossible to tell if he is correct in his assumptions. These photos were taken about a mile South of Lazonby, just North of North Dykes and a few hundred yards South of Scatter Beck. I'm not saying for sure that the scarp upon which the field wall is built represents the remains of Salkeld Dykes, but it is roughly the right area, and is in marked contrast to the flat fields either side of it. Above. Looking West. The field wall is built on an earthen bank some six to eight feet high. Above. Looking East. Rough earthworks can be seen just to the front of the field wall. Above. A closer view of the earthworks in front of the wall. Above. Looking West again, showing the field wall built on top of the earth bank. The dykes are thought to have been defensive earthworks thrown up around Great Salkeld as a defence against raids and as a Parish boundary marker. These photos are a tentative suggestion of the earthwork dykes that may have existed. More information can be found at the Gatehouse website. This large earth mound lies a few yards to the West of the church of St Nicholas, and to the East of Lazonby station. 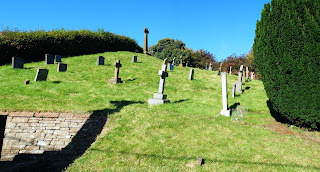 It is a huge mound, and only seems to have been labelled a motte by M.J. Jackson in his 1990 book, Castles of Cumbria. 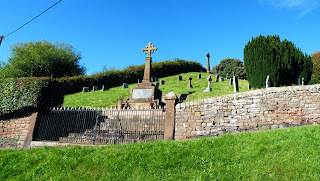 It probably stands to around forty feet high, is topped with a stone memorial cross, and has been heavily mutilated on its West side to make way for an access road to the railway station. It is visible from the aerial photos on Multimap's website. It's also especially visible on Simon Ledingham’s photo on the Visit Cumbria website and the page on St Nicholas. The church of St Nicholas may well have been built in the bailey area, as other motte and bailey sites throughout Lancashire and Cumbria (Melling, Burton-in-Lonsdale, Arkham and Whittington) The present church dates only from 1864, but replaced an earlier church on this site. Easily visible from the roadside and from within the church yard, this is a quite spectacular earthwork...if only there were more documentary evidence to back it up. Above. The now disused Control Tower building. Above. One of the massive Cruise Missile storage bunkers. Above. The secure area surrounding the Cruise Missile storage bunkers. Above. The Cruise Missile storage bunkers. Fantastic aerial photo of Greenham Common today. Oxford Castle was founded in 1071, not long after the Norman invasion of 1066. The original fortification may have been constructed of wood and later replaced with a stone tower. Excavations beneath the motte and in surrounding areas have uncovered evidence of pre-Norman (Saxon) habitation. The impressive St George's tower, may be from this earlier period, and can be found a few yards from the Southern side of the motte. Above. The motte from South. The fact that the motte appears to have been built over Saxon remains, could indicate a symbolical burying of the old (Saxon) and replacement by the new (Norman) and a firm establishment of Norman control over the city. Above. The motte from New Road to the North. The Norman castle was established by Robert D'Oyly, who came to England with William the Conqueror, and built very soon after Oxford was invaded. Originally standing to around eighteen metres high, it has been somewhat reduced in height now. St George's tower may have been added to the castle around 1074, using the foundations of an exisiting Saxon building. Easily seen from the road to the North and from the castle courtyard, this is an impressive motte.